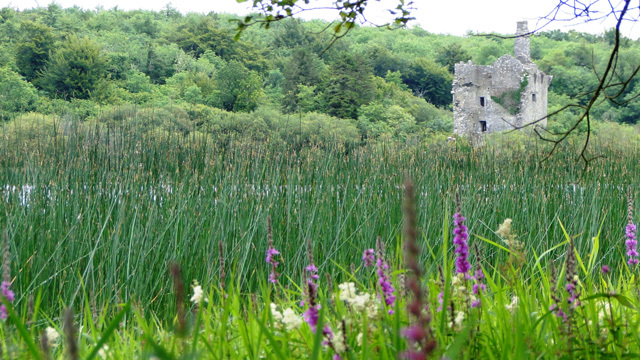 Notes: Dromore Castle was probably constructed in the early 16th century. In the 17th century, Teige O�Brien of the O'Brien clan repaired and expanded it. The castle and lands of Dromore had been granted to Teige's father, Connor (Third Earl of Thomond), in 1579. Dermot, son of Teige, was an important protagonist in the Confederate Wars and participated in the Siege of Ballyalla Castle (Ennis). The last O'Brien at the castle was Conor, who left in 1689. The castle fell into ruin in the 18th century. In 1814, Jonas Studdert, third son of Richard Studdert of Clonderalaw, lived in Dromore House. He had married Mary Crowe of Dromore in 1795. In 1837, the house was the home of R. Crowe. Although it was originally a hunting lodge, it became the main seat of the Crowe family in the 1830s. In 1855, during Griffith's valuation, Thomas Crowe was listed as occupier ("in fee") of Dromore and neighbouring Cahermacrea townlands and some others. In 1901, the Census listed Thomas Crowe as proprietor. Dromore House was sold in 1936 and later demolished. Dromore Wood was bought by the Irish state in the 1940s and subsequently used as a commercial forest. In the 1980s, the National Parks and Wildlife Service (Office of Public Works) took over. In 1985, the area became a statutory nature reserve. Other historical sites nearby include ruined Cahermacrea Castle, the remains of Kilbakee Church, two ring forts, a limekiln, a children's burial ground and a chapel. "Dromore Wood Nature Reserve". Burren National Park. Retrieved 16 December 2013.